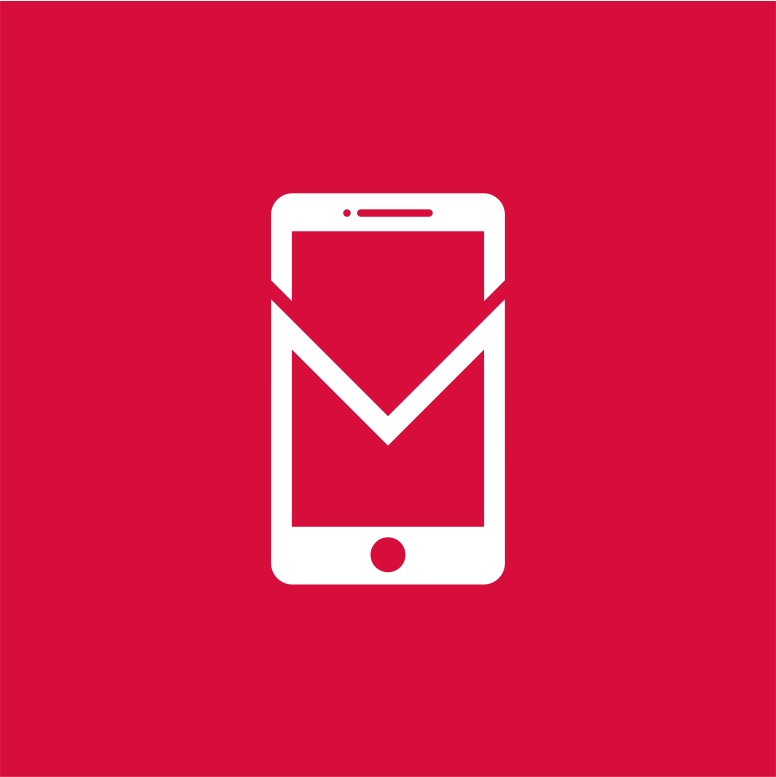 The ability to think about mobile marketing campaigns from the perspective of an LTV / CPI delta is largely a luxury afforded to developers with substantial balance sheets (or, unfortunately, an existential mistake made by small developers without sufficient expendable cash to finance growth). Running mobile marketing campaigns against the profitability of LTV over CPI (that is, profitable unit economics of revenues vs. marketing costs) requires some available pool of capital to spend against before cohort revenues make up for the unit costs of acquisition. In other words, because LTV is paid out over some projected time period (eg. 12 months, 18 months, etc.) 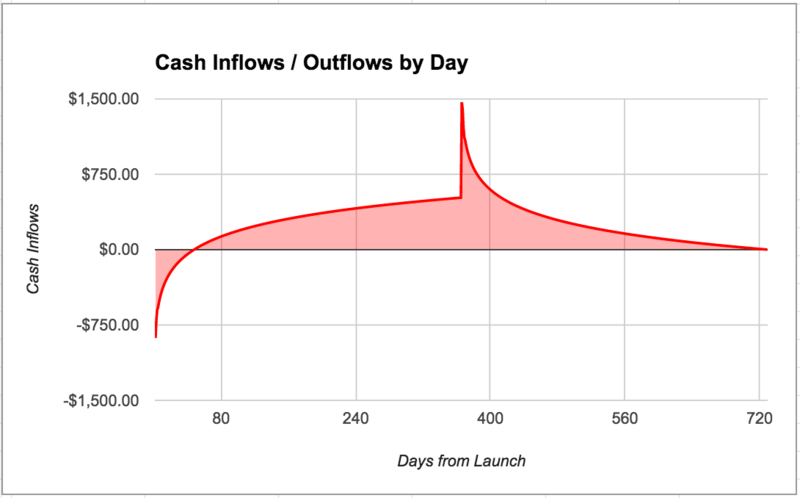 yet marketing costs are born upfront (usually due within 30 days of a campaign being run), developers need to consider not only the ROI of their campaigns (ie. the degree to which LTV exceeds CPI) but also the schedule of the cashflows that their acquired cohorts generate. Assume this developer has decided that any marketing spend must generate 50% ROI after 365 days (that is, $1 spent produces $1.50 in total cumulative per-user revenues by day 365). 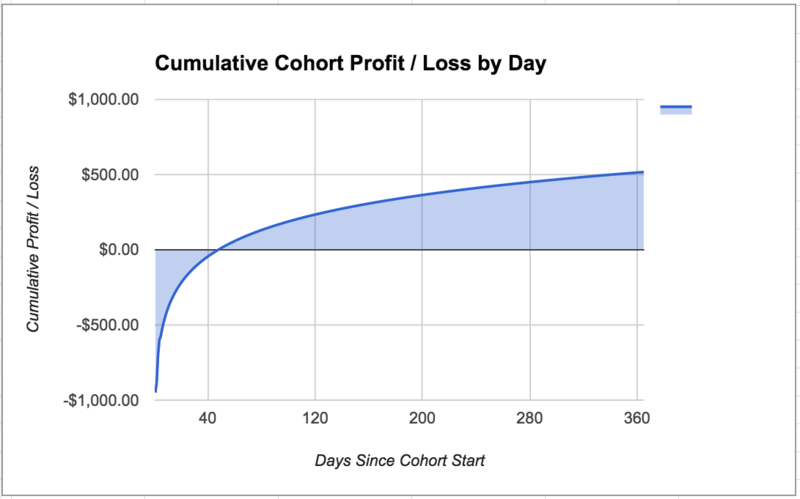 This developer can achieve that ROI by buying cohorts with a $1 CPI, with each cohort achieving break-even at day 48 (as per the LTV tab in the spreadsheet linked above). Each cohort is expected to remain active for 365 days. Now assume that this developer is able to acquire cohorts of 1,000 users per day at this price ($1 CPI); the developer will run this campaign for one full year before turning it off completely. As the cohorts accumulate, marketing spend losses accumulate to a greater degree than do revenues, until Day 48, when the revenues generated by the 48 live campaigns ($1,000.86) exceed the upfront marketing cost paid to acquire the 48th campaign ($1,000). 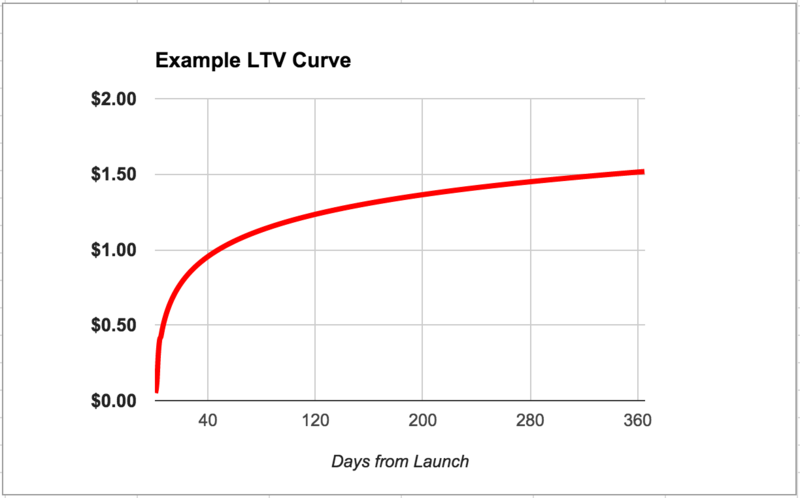 Keep in mind that the revenue schedule of this LTV curve is specific to this example and was generated randomly. Which is to say, the developer is spending more money than it is making until Day 48 (revenues spike at day 366 because the developer turns off marketing spend yet still has 364 cohorts active). 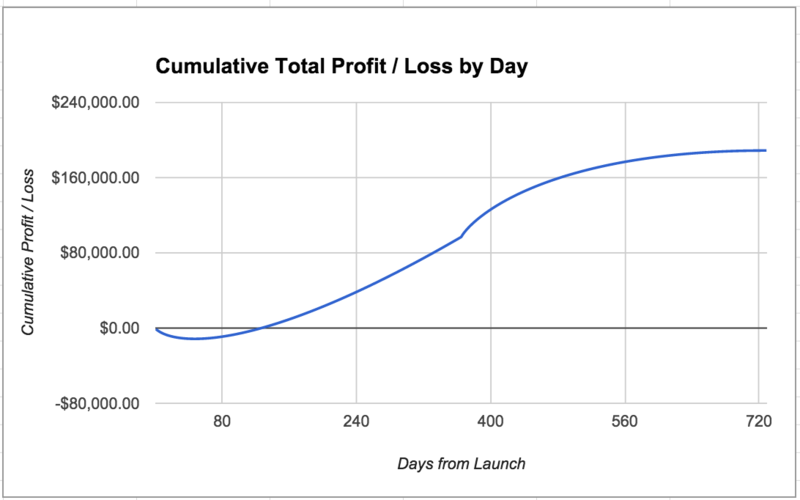 What this example illustrates is that, despite making roughly 50% ROI on all marketing spend (earning back $1.52 for every $1 spent on marketing), this developer is spending more money than it is making for more than a month (48 days) after launch. The total spend of $365,000 produces revenues of $553,848, for an operating profit of $188,848. But the developer had to float a loss of $11,454 before it started generating positive cash flow (eg. 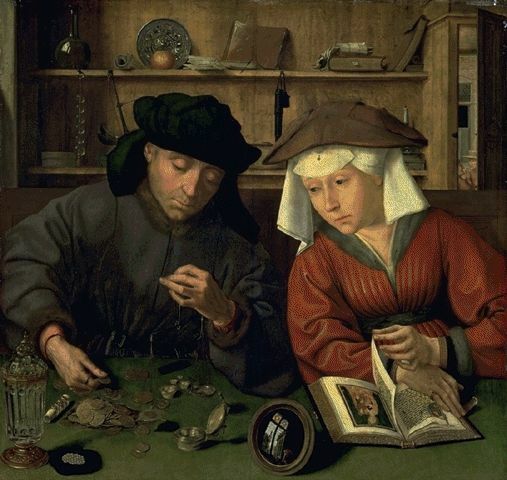 was making more money than it was spending). Even at a massive profit margin, this developer needed 6% of two-year profits and 2% of two-year sales up front (that is, offset by cumulative recoup) to fund its marketing campaigns. Before launching a product, every developer needs to consider its ability to do the same.